VocabularySpellingCity is an award-winning educational website focusing on spelling and vocabulary. Our site is used by millions of teachers and parents worldwide. Students from six South Florida schools visited VocabularySpellingCity headquarters to learn about five high-tech careers: 3D graphics, 2D animation, coding, quality assurance, and customer support. They were fascinated to see how our jobs make the learning activities they use in school fun and engaging. 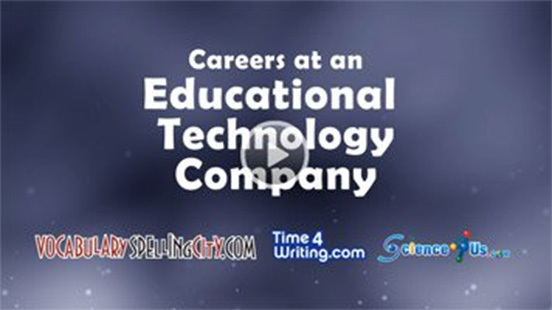 To apply for any of these jobs, please send a cover letter and resume to jobs@spellingcity.com. No phone calls. No headhunters. Are you a parent or teacher or who is an active user of VocabularySpellingCity? Are you net savvy and active on social media sites? Do you have a blog? Are you a presenter at educational conferences or professional development sessions? Would you like to be? If you answered "yes" to any (or all!) of these questions, we might be able to use your help! We sometimes have opportunities available for active VocabularySpellingCity members. If you are interested in beta testing for us, writing a review of the site on your blog, or helping us to spread the word about VocabularySpellingCity, we'd love to hear from you. Email us, telling us about your background and your experience with VocabularySpellingCity (length of time, free or Premium Member, etc. ), social media (which sites, how many followers, do you have a blog, etc. ), and/or public speaking (which conferences, events, etc.). There may be a great opportunity waiting for you.